A limited edition press of only 1000 copies as a three-disc, Dual Format DVD/Blu-ray release with cardboard sleeve. 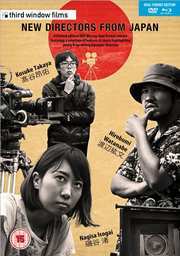 A collection of features and shorts highlighting various new and young directors from Japan. Featuring works from a trio of directors including interviews with each director and others attached to their films. Two films from 28-year-old female director Nagisa Isogai – ‘My Baby’ (16min) & ‘The Lust of Angels (40 min), the debut feature film from 31-year-old Hirobumi Watanabe – ‘And the Mud Ship Sails Away’ (88 min); and a 35mm short film from 27-year-old Takaya Kosuke ‘Buy Bling, Get One Free’ (27 min).